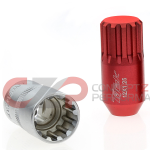 TiTek Lug Nuts are made of 7075 Aluminum Alloy. They are one of the highest strength aluminum alloys, with a tensile strength of 83,000 psi. Because of its strength to weight ratio, they are commonly used for aircraft and aerospace technologies. Constructed for your vehicle, TiTek Lug nuts come in a series of matte colors such as black, red, blue, and gold. Both the Racing and Speed series are open in design. The Racing series come in a length of 45mm while the Speed comes in a 60mm and both utilize a 19mm socket end. Sold as a pack of 4: 4 packs are required for a set of 16; 5 packs are required for a set of 20. Locks are sold in a pack of 4 also, so order 1 less set of lug nuts if you're getting a set of locks as well. Locks are available from the link below. Note: These Will NOT Work On A 370Z Or G37 w/ Stock Wheels! !